Split Sleeve Coupler Chrome Steel 1"
Lower Flange for the C-500 V-Drive to the Prop Shaft for a 1" Prop Shaft. Lower Flange for the C-500 V-Drive to the Prop Shaft for a 1-1/8" Prop Shaft. 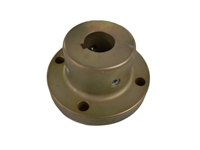 Lower Flange for the Borg Warner Transmission 71 Series & Champion V-Drive to the Prop Shaft. Lower Flange for the Borg Warner Transmission 71 Series & Champion V-Drive to the Prop Shaft for a 1-1/8" Prop Shaft. Power Take Off for the V-Drive to the drive line. Heavy Duty Split Sleeve Coupler Steel 1"
Heavy Duty Split Sleeve Coupler Steel 1-1/8"
Casale 5 Bolt Heavy Duty Steel Split Sleeve Coupler for 1" V-Drive output shafts to 1" prop shafts. Casale 5 Bolt Heavy Duty Steel Split Sleeve Coupler for 1-1/8" V-Drive output shafts to 1-1/8" prop shafts. Heavy Duty Split Sleeve Coupler Steel 1-1/4"
Heavy Duty Step Split Sleeve Coupler Steel 1" - 1-1/8"
Casale 5 Bolt Heavy Duty Steel Split Sleeve Coupler for 1-1/4" V-Drive output shafts to 1-1/4" prop shafts. Casale 5 Bolt Heavy Duty Steel Split Sleeve Coupler for 1" Shaft to 1-1/8" Shaft. Heavy Duty Step Split Sleeve Coupler Steel 1-3/8" - 1-1/8"
Casale 5 Bolt Heavy Duty Steel Split Sleeve Coupler for 1-3/8" Shaft to 1-1/8" Shaft.